Stay connected to your business as well as online friends and family via the high-speed Sprint Mobile Broadband Network with the Novatel Wireless Merlin C777 2-in-1 modem. With the locking 2-in-1 adapter, you can plug this innovative card into either the PC Card or ExpressCard slot to make frequent use and travel easy as well as free up USB ports for your other devices. In addition to e-mail and Internet access, the C777 offers GPS support, enabling the use of location search and common navigational software tools on a notebook computer via Sprint SmartView. 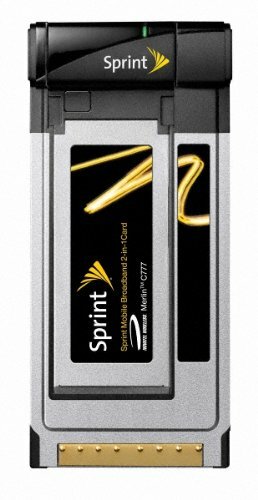 Plug this innovative card into either the PC Card or ExpressCard slot on your laptop for mobile 3G broadband via Sprint's EV-DO network. 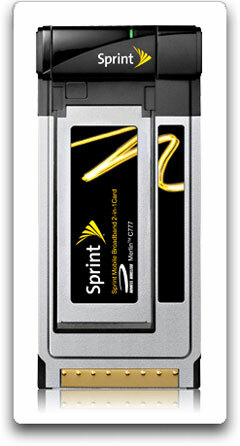 The C777 modem is optimized for Sprint's Evolution-Data Optimized (EV-DO) Revolution A (Rev. A) network, which provides average download speeds of 600 kilobits per second (kbps) to 1.4 megabits and average upload speeds of 350 to 500 kbps. When connecting within a Rev. 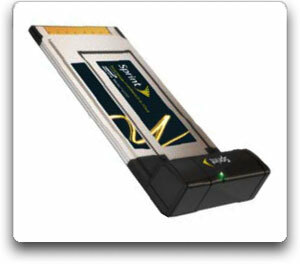 A coverage area, the C777 can download a 1 MB e-mail attachment in about 8 seconds and upload the same-sized file in less than 13 seconds. Autonomous and simultaneous GPS using Sprint Navigation for turn-by-turn directions, and points of interest searches. Sprint's SmartView automatic installation software, available for both Mac and PC users, installs directly from the modem on first insertion. Simple Activation with just "one" more click after software installation. Easy installation with the software CD provided in the box. Note: Users must activate this device on a Sprint account before inserting the device.